Forest Hill Youth meet together on Sunday mornings. After a time of worship and prayer together with the whole congregation, the youth go out with our committed youth team to learn more about Jesus and how to journey with Him. Instead of just talking at our youth, we believe in ‘doing life’ together, and so the youth team, together with other leaders from the congregation, make other times to meet up and encourage the young people in their life with Jesus, giving opportunities to talk about the tough issues they face in becoming adults in London in a relaxed and social environment. We’ve had baking parties, trips into central London and a fantastic fireworks night! 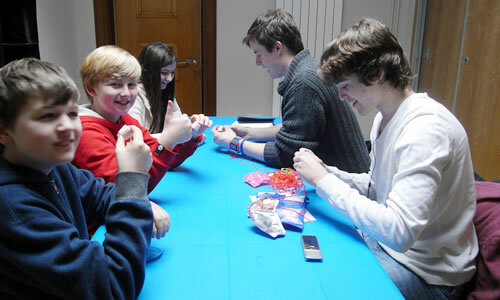 Every Friday afternoon, whatever the weather, the youth team give out free, (yes, free!!) hot chocolate (which is very good, if we do say so ourselves) on the street to the local secondary students of Forest Hill on their way home from school. We invite them along to church on Sunday morning, challenge them to think about Jesus, offer to pray with them or sometimes just be there to chat through any issues in their lives. Forest Hill Youth also connects with the rest of Ichthus Youth particularly through the Big Weekends.